The latest good news from Aikido World Headquarters in Japan: Yukimitsu Kobayashi Hombu Dojo Shihan - who will be visiting Ljubljana, Slovenia in March 2008 - has been promoted to 7 Dan. 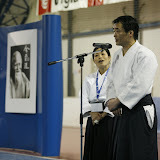 A 12-member delegation from the Slovenian Aikikai Federation took part in the annual Aikido winter school in Amsterdam. For some of us, this was the sixth year of practice with Wilko Vriesman Sensei.